The 15th Classical Tamil Summer Seminar will take place this summer from September 18-22 at the Pondicherry centre of the EFEO (and, for practical reasons, not in Yercaud as announced earlier). We will be reading selected parallel passages from the Naiṭatam/Naiṣadha in three different versions, namely the Tamil with Indra Manuel, the Sanskrit with R. Sathyanarayanan and the Telugu with S.A.P. Anjaneya Sarma. This summer’s meeting will last only one week because we have plans for reverting to winter seminars: the next full Classical Tamil course will take place as a CTWS in February 2018 (most likely 5 February to 2 March), texts as yet to be settled after this summer’s discussions. A beginner’s class will take place if there is a minimum of 5 inscriptions by the end of this year. Please make your application informally to Mrs Prerana Patel (PreranaPatel@efeo-pondicherry.org). 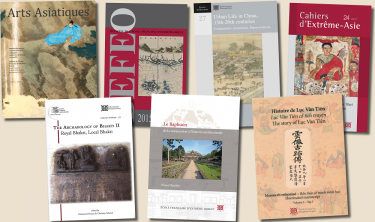 In order to highlight the EFEO publications, a new website dedicated to them is online. You can now consult the catalog of all the books published since the creation of the EFEO and buy directly those that interest you HERE. The third workshop in the series The Archaeology of Bhakti will take place at the centre of the EFEO in Pondicherry from the 3rd to 14th August 2015.